When you have an enterprise project and you are managing the project plan on MS Project Server environment, you have the option to send the resource assignments to team members and request the task progress from them. You have to use the Publish feature to do this activity. Publishing a project also publishes its assignments. As your project progresses, you may need to make changes to your tasks and assignments. These changes must be published to make them available to your team members. By publishing the project, all the views in PWA will get populated with project information. If you are publishing the project plan first time or project plan do not have a workspace site (SharePoint site) you can create one now. To create a SharePoint site, select create a workspace for this project. 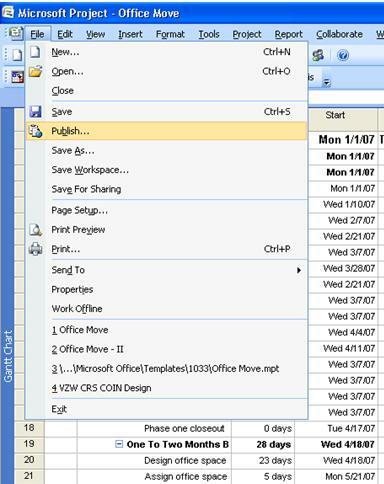 Please check the publish status bar at the bottom of the project plan; Once publish is completed, status bar will display "Publish job completed successfully"
NOTE: The publishing process in Microsoft Office Project Professional 2007 is different from MS Project Server 2003. Publish process has been changed in Project Server 2007, so that all assignments are sent to all resources in the project plan. As a result, MS Project Server 2007 doesn't support �Publish New and Changed Assignments" feature.